Signal Studios’ XBLA Toy Soldiers games provide an inspired twist on the tower defense formula. The setting involves a conflict between two factions of army men, making for fun use of scale and nostalgia. The gameplay is unique because players not only purchase turrets to thwart incoming waves of attackers; they actually get to take control of said turrets and other vehicles, infusing the strategy with some much-appreciated action. The most recent entry, Toy Soldiers: Cold War also introduced a variety of minigames to keep players entertained between campaign missions. 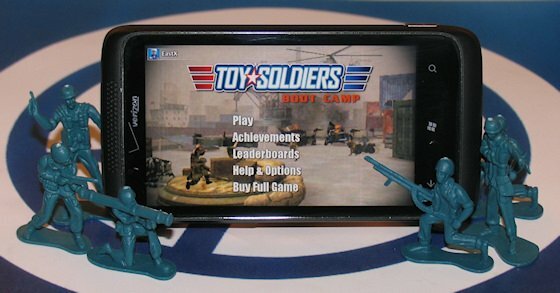 Now Krome Studios has shrunk some of those pint-sized minigames down into an even more compact package in Toy Soldiers: Boot Camp for Windows Phone. While Cold War contained six different minigames, only three of those made the trip to Boot Camp: Flyswatter, Cardboard Theater, and Flyswatter. A swarm of flies have invaded a cluttered desk. It’s up to the player to shoot them down with a rapid-fire turret. You get score bonuses for clearing whole waves of bugs, shooting them down quickly, and taking out gold flies. Not only do gold flies explode when downed, taking out nearby insects, they also destroy any other gold flies on screen. Flyswatter is easily the best of Boot Camp’s minigames. It looks great, with numerous huge, detailed flies whizzing about. Most importantly, it’s easy to control. You just aim and shoot, with nothing else to worry about; the turret never overheats or anything like that. Plus we can all agree that flies are complete jerks and deserve whatever punishment they get. While this one is a shooting gallery as well, it plays quite differently from Flyswatter. Here you’re firing at automated cardboard targets rather than nasty insects. Each kind of target is worth a different number of points, with the smaller and faster ones giving larger rewards. Instead of a machine gun, players control a rocket launcher. You can either fire and forget or manually steer the rocket, adjusting its trajectory and speed as it zooms toward the cardboard city. The speed controls are overcomplicated as you have to manage a slider on top of watching where the rocket is going. This one is decent on Windows Phone, but worked better on consoles. Cold War’s worst minigame also happens to be the worst in Boot Camp. Here you steer a rocket down a tube, trying to fly through as many spinning rings as possible before crashing. The best strategy involves staying near the center and dodging the oncoming barriers as necessary. This one was no fun on the Xbox 360, and it’s even less so while having to manage a speed slider. I can only assume it was chosen because it’s very simple graphically and uses the same steering mechanics as Cardboard Theater. None of these minigames takes very long to play – Flyswatter and Cardboard Theater each have a one minute timer, while Thread the Needle goes on until the player crashes (usually less than a minute). I wish the two fun minigames had been expanded to include longer games modes. Boot Camp doesn’t have a metagame tying everything together, so the only real goals are high scores and Achievements. Score-oriented games can work fine on mobile phones, but even still the package feels a bit anemic. A few additional minigames would have provided a lot more staying power. Boot Camp offers three different control types: swipe, tilt, and d-pad. Players can also enable Southpaw, swapping the position of the on-screen buttons and/or d-pad, as well as Inverted aiming. All of these options can be changed at any time from the pause menu. Unfortunately, none of the control options feels quite right. The default swipe controls are a bit too slow to be effective. Tilting works passingly well, but it doesn’t recenter very well and just feels awkward. For my money, d-pad is the best of the bunch, but that’s not saying much. The d-pad is far too small, making it difficult to use without looking directly at it – your thumb will just end up straying from the pad. Plus it acts like a digital d-pad rather than analog, so fast aiming is out. Boot Camp is still playable despite these issues, but it never approaches the playability of the console version. The developers have expressed interest in fine-tuning the controls via an update; hopefully Microsoft is kind enough to give it the go-ahead. Krome Studios previously ported the Game Room titles like Centipede and Pitfall! to Windows Phone. Those games all had global Leaderboards, whereas the vast majority of Windows Phone Xbox Live titles are limited to friends Leaderboards. Thankfully, Boot Camp got the Global Leaderboard treatment too. For a game that’s all about earning high scores and nothing else, the ability to compare your score with the world at large adds a lot. Another bonus that we seldom see in Windows Phone games: the ability to take screenshots. At any point, whether navigating menus or during gameplay, you can always take a screengrab by tapping the camera icon at the top-right corner of the screen. Screenshots save to your phone’s Photo folder, where they can be shared like any other picture. Finally, as mentioned in our developer interview, owning Boot Camp is supposed to unlock a special feature or two in the Toy Soldiers: Cold War DLC. Only one problem – the DLC was slated to come out months ago but never materialized! As such, I can’t say whether the connectivity will unlock anything of value. WPCentral will be sure to let you know whenever the console DLC and associated feature finally become a reality. Boot Camp’s Achievements are some of the easiest in recent memory. You can get them all in an hour, provided Thread the Needle and Cardboard Theater don’t give you too much trouble. Three are secret: watch the entire credits (yay), fire a missile into the fireplace in Cardboard Theater (frustrating due to the controls), and shoot down the bugzapper in Flyswatter. Toy Soldiers: Boot Camp is quite a tease. It’s attached to an awesome Xbox 360 game that probably could have been ported wholesale to Windows Phone with only a slight loss in fidelity. Indeed, the graphics here do a fantastic job of capturing the looks and nostalgic 1980s atmosphere of the original, and you’ve gotta love the shared global Leaderboards. But instead of a substantial experience, we get a paltry three of the console version’s minigames, one of which stinks like onions. Most important, none of these minigames lasts more than a minute – Zombies on the Phone this ain’t. Achievement hunters will surely love Boot Camp for its brevity, but that same plus will prove to be a minus to many other gamers. Toy Soldiers: Boot Camp costs $2.99 and there is a free trial. Get it here on the Marketplace.